Editor's note: The below are intended to be general recommendations for yoga practitioners and teachers. They are not a replacement for the personal advice of a health professional. Yoga teachers should remain within their scope of practice: This means not attempting to diagnose, treat, or offer medical advice to students. What could these three things have in common? • Tension headaches: Recurring headaches of moderate intensity that are not aggravated by movement and are felt on both sides of the head as pressure rather than pulsing. • Temporomandibular disorder (sometimes called TMJ after the temporomandibular joints): Jaw pain or dysfunction, sometimes accompanied by pain in the face. • Neck pain such as cervical radiculopathy: Pain or weakness caused by a compressed nerve in the neck that radiates into the shoulders, arms, and hands. If you guessed that the alignment of the shoulders, head, and neck may play a role, you could be right. Bill Reif, physical therapist and author of The Back Pain Secret: The Real Cause of Women’s Back Pain and How to Treat It, says that one specific postural habit may be at the root of these three seemingly distinct conditions: forward-head posture. While many of us are now used to being told that forward-head posture is problematic, less commonly known are the specific problems forward-head posture might cause, how exactly the forward position of the head could lead to those problems, and how to effectively lessen this problematic head position. Understanding these issues may enable us to create yoga practices that are both safer and more helpful for us or for students with any of the conditions mentioned above. As many of us may have experienced firsthand, “Posture can change because of texting or computer work,” Reif says. “To see the screen better, you might protract and flex your neck, bringing your head in front of your shoulders and your chin toward your chest. Your head and neck can get ‘stuck’ in that position.” The back of the neck is supposed to curve inward slightly, and “Often people with chronic forward-head posture are told after an X-ray that they have a ‘flattened or reversed’ cervical curve,” he adds. However, an X-ray is generally not needed to spot forward-head posture: All we have to do is look at ourselves from the side—in which case we’d see that the head is in front of the shoulders—or stand with our back against a wall, and notice that the back of the head does not touch the wall. 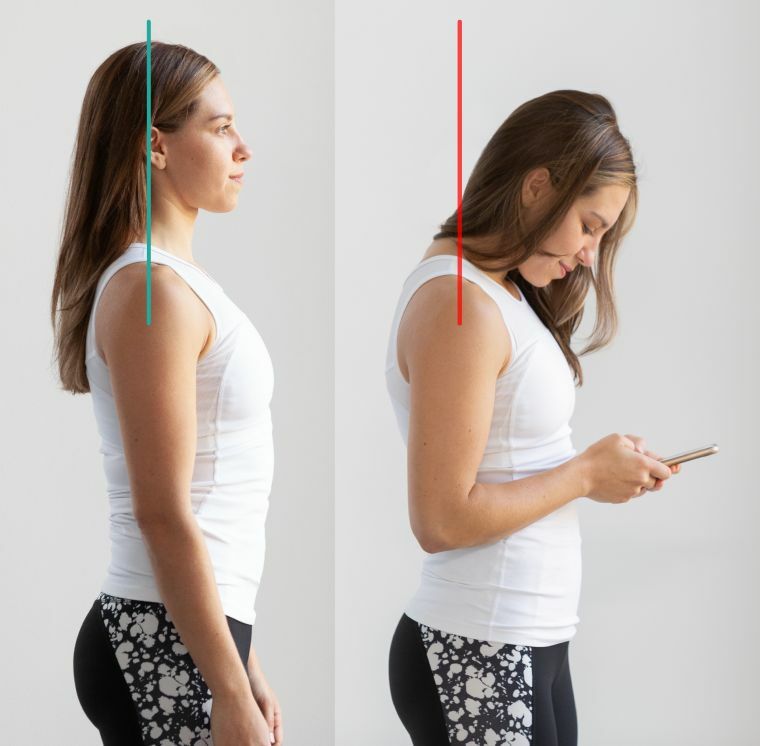 A loss of height might signal forward-head posture as well, or some combination of forward-head posture and thoracic kyphosis (a rounding of the upper back especially common in those with osteoporosis). A neutral head position compared with a forward head position. Forward-head posture is problematic in part because as the head moves forward and down from its neutral position, it’s as if the head gets heavier; more force and thus strain is placed on the cervical spine. The muscular repercussions of this posture can include the shortening of the cervical extensor muscles (the splenii and upper trapezius and the sternocleidomastoid) and the weakening of the cervical flexor muscles (including the longus capitus and longus colli) as well as scapular retractors such as the middle trapezius. 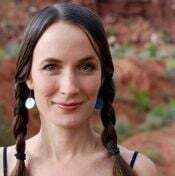 Envision this: Someone touches her chin to her chest, which gives her zero degrees of neck curvature. Then, she looks up, tilting her chin toward the ceiling while keeping her head forward. “It is this position,” Reif says, “in which you are extending the neck without first retracting it by tucking the chin, that pinches C1 and C2—also known as the atlas and the axis.” If done chronically, or to an extreme, this position could eventually lead to neck pain, or refer pain to the head, shoulders, arms, or jaw. Avoid extending the neck without first retracting it (as pictured above). Yoga teachers may notice this compressed position when students with forward-head posture try to follow the cue “Bring your ears back over your shoulders.” We might see their Adam’s apple protruding and the back of their neck creasing. We might also see this compression occurring in savasana. Absent padding under the head, if a student with forward-head posture lies on their back, their chin might tip up toward the ceiling so much that an eye pillow would slide toward their forehead. Happily, yoga, when practiced with attention to the alignment of the head and neck, may not only help alleviate symptoms that stem from muscular tension and/or nerve compression, but also their cause. Forward-head posture need not be permanent. In fact, targeted neck exercises have been able to successfully decrease the angle of forward-head posture. “A personalized physical therapy plan would require knowing where and why a particular person was restricted in order to give more specific advice, but a general approach which will often work to relieve headaches, neck pain, and TMD symptoms would include poses or exercises that enable better head and neck alignment and gently mobilize the first two cervical vertebrae,” Reif says. There is support for Reif’s assertion that forward-head posture is a component of some neck pain, jaw pain, and headaches, and that improving posture can help. Neck pain seems to be more severe in those whose forward-head posture is greater, and a study of nearly a hundred people with cervical radiculopathy—“radiating” neck pain—found that decreasing forward-head posture decreases pain. Those with TMD seem to position their heads farther in front of their shoulders than those in control groups. Some dentists and physical therapists see postural improvement as a critical component of the treatment for TMD, since the position of the head and neck affects the position of the mandible (lower jawbone). According to one study, over-activation of nerves in the neck (a potential consequence of forward-head posture) is the most likely culprit for a tension headache, which is often associated with sensitivity in the neck muscles. Another study found that headaches with their roots in neck pain seem to stem in part from poor head and neck alignment. In yet another study, those with tension-type headaches showed a more exaggerated forward-head posture than those in control groups. Of course, while posture may well be a significant part of the picture in the conditions mentioned above, genes and the environment can also be factors. So can injuries, especially those that result in a loss of mobility of the upper cervical vertebrae. It is important to consult with your physician for a diagnosis and advice about the best course of treatment. Certainly seek medical advice if your head, neck, or jaw pain does not respond positively to the suggestions below. Yoga, practiced with attention to head and neck alignment as detailed in the “do’s” below, may help ameliorate postural problems and resultant muscle tension and nerve compression that can be factors in tension headaches, neck pain, and TMD. 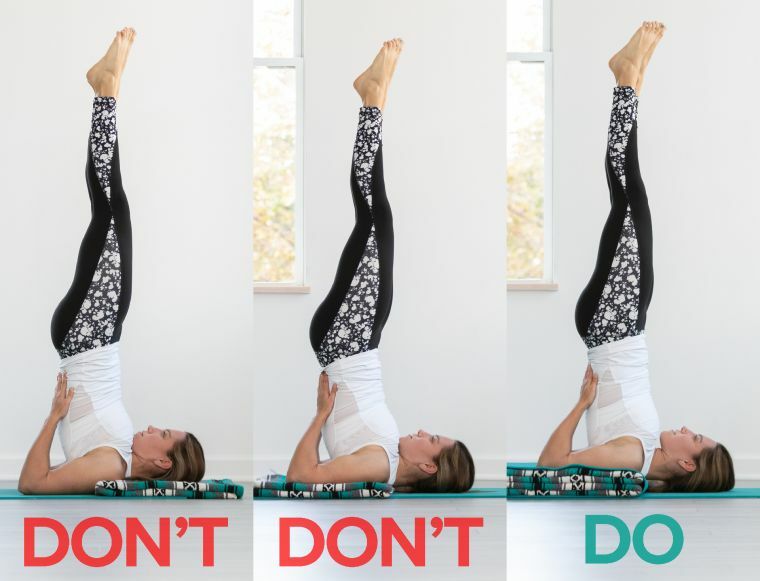 However, there are a few yoga “don’ts” that could actually make those symptoms worse. Consider enlisting a teacher or partner (or a couple of mirrors) to help you with the first two “do’s” since the alignment of the shoulders and neck can be hard to see. Reif recommends that you close your eyes at times when it is safe to do so and “Go inward to establish a mind-body connection. Notice if you are unnecessarily tensing any muscles, and try to relax them.” Pay special attention to relaxing the muscles around your eyes, the space between your eyebrows, the back of your neck, and your shoulders. 1. Don’t bow frequently or excessively. By definition, if you have forward-head posture, your neck is excessively and habitually protracted and flexed: That is, it has moved forward and down from its anatomically neutral position. Excessive, frequent neck flexion in or out of yoga class may reinforce this suboptimal pattern and even cause injury in poses where the head and neck bear weight. For example, Reif says that while the head may bow forward slightly in a forward fold with no negative consequences, “applying pressure to a flexed neck—in shoulderstand, for example—is always unsafe.” He adds that shoulderstand is safer if blankets support the shoulders and allow the back of the neck to curve. DON'T put your head/neck ON a blanket. DON'T use just one blanket if you can't maintain your cervical curve. DO use 2+ blankets, and fold your mat over them to provide more traction. Bridge pose (which places less weight on the shoulders, neck, and head than shoulderstand), is, according to Reif, fine for most students to do without support as long as they allow a gentle curve in the neck (instead of drawing the chin toward the chest). If this is not comfortable, though, students can place blankets under the upper back and shoulders in bridge pose. 2. Don’t move the neck into sudden and extreme extension (backward). “By suddenly moving into extreme extension from a forward-head position, you can easily pinch the base of your skull,” Reif says. So, in poses like upward facing dog, half forward fold, or reverse tabletop, before you extend your neck, align your shoulders and retract your neck. Then move into extension from this neutral position. You may want to keep the amount of extension slight when you first begin practicing this movement, increasing the amount of extension gradually as your forward-head posture decreases. 3. Don’t rotate your neck to a degree that causes strain. Turning the head too far (or too fast) may cause strain for those with sensitive or misaligned necks. In twisting poses, align your shoulders first. Then retract your neck, drawing your chin back until the back of your neck is long, and then slowly turn your head only to a degree that does not cause pain. All versions of headstand place the majority of the body’s weight on the neck and head and may worsen head, neck, and jaw pain. “Those with extreme forward-head postures have a mechanical disadvantage and should not do headstand, as their neck is already in a shortened and thus vulnerable position,” Reif explains. He also discourages students with any history of neck issues, osteoporosis, hypertension, or hypotension from starting a headstand practice. This sequence puts these suggestions into play and supplements them with movements designed to improve neck strength and flexibility. Because there is often some overlap between forward-head posture and kyphosis, the suggestions offered in the article “Yoga for Kyphosis” may also be helpful for those with forward-head posture and head, neck, and jaw pain. When, through careful realignment and targeted sequences, you succeed in reducing forward-head posture and hopefully as a result, the neck and jaw discomfort and headaches that may arise from it, you might feel a sense of relief—as if someone has taken a burden from you. It is, in fact, your own well-aligned bones that will have lightened the weight of your head.